256 in stock Need More ? 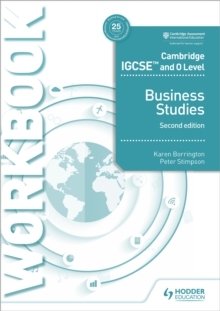 Exam board: Cambridge Assessment International EducationLevel: IGCSESubject: Business StudiesFirst teaching: September 2018First exams: Summer 2020This title is endorsed by Cambridge Assessment International Education to support the full syllabus for examination from 2020. Reinforce learning and deepen understanding of the key concepts covered in the latest syllabus; an ideal course companion or homework book for use throughout the course. - Develop and strengthen skills and knowledge with a wealth of additional exercises that perfectly supplement the Student's Book. - Build confidence with extra practice for each lesson to ensure that a topic is thoroughly understood before moving on. - Fully explore and analyse international businesses through exercises based on authentic case studies. - Keep track of students' work with ready-to-go write-in exercises. - Save time with all answers available in the Online Teacher's Guide (a subscription to the Teacher Guide is GBP120 for access until 31 August 2023).